Schiavone Inspiring a New Generation of Future Engineers! Inspiring kids to think big is the concept behind Those Amazing Engineers Adopt-A-School program presented by Trilogy Publications. Those Amazing Engineers is a lively, fun-to-learn book designed to capture the interest of elementary and middle school students. The book covers all the major engineering disciplines and helps students identify with the fascinating careers that start with applying themselves in math and science subjects. The program is a perfect fit for Schiavone who has always been committed to mentoring young engineers through university level sponsorships and activities. Now with this program, Schiavone begins to help motivate an even younger generation of future engineers. Schiavone adopted 2 schools in 2011: Clarendon Elementary School in Secaucus, NJ and NYC Public School #257 in Brooklyn. 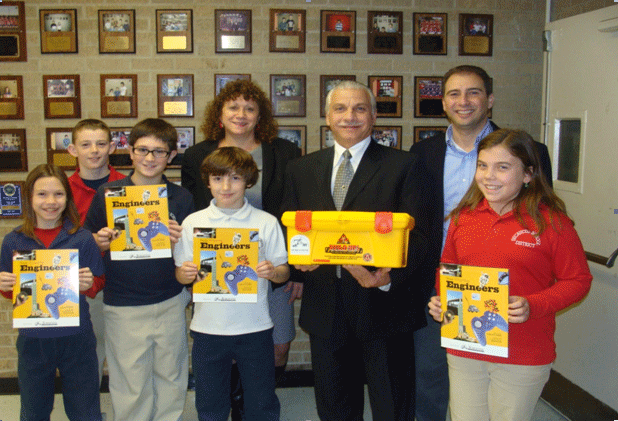 Vice President of Field Operations, Anthony Del Vescovo and Contracts & Security Information Manager Dorrie Elk, returned to their elementary alma mater, Clarendon Elementary in Secaucus, to present the Amazing Engineer books to Principal Pat Cocucci and 6 th grade team student representatives: Nicole Gallo, Patrick Taylor, John Mastorpietro, James Giegold, and Daniella McGarty.